Can I install a Rachio on my current system? Is it possible for me to wire an Intermatic to Rainmachine? I Have a Sprinkler Pump - Can I Replace an Indexing Valve with Automatic Zone Valves? You definitely have three zones, based on six control pins between 4 and 6 AM (three pins turn the system ON, the other three turn it OFF). You also have an indexing valve (so you will want to update not only the controller), I’ve been in similar situation (link), upgrade is well worth it. For example I see that your controller is set to water one of the zones for twice the time of the others, but if there ever been an issue (which is very likely) whereas power went out (due to Florida hurricanes) or something similar, in a middle of the cycle, your controller would go out of sync and from than on a wrong zone would get twice the water. It took me about two days to replace a similar timer and four zone indexing valve, professionals can do it in a few hours. Adding a motor relay is pretty straight forward, you can pick one up in your local Home Depot or Lowes and wire it up to the master (M) terminal (don’t forget to enable it in the software). I’m also in Florida, water savings and rain awareness are well worth it. Pump start relay in a weatherproof enclosure sized for pump hp and voltage in the system. The power would go to the pump start relay instead of the Intermatic timer. The lead from the Rachio Master Valve terminal would also go to the pump start relay to turn on the pump. Configure the Rachio zones as mentioned in the lead link that Gene and I both linked to. And I see that @Gene finally responded (I knew he lives in Florida and I figured he had experience with the hydraulic indexing valve setup. I had been waiting for him to respond, but gave up and started on my reply). Or you can reconfigure the system like Gene mentions. @rmadrid20 In case you miss it in the small print of the indexing valve writeup, we both linked to, Rachio Flex schedule will not work with indexing valves. So you can continue using the valve without upgrading it, but only the Manually set schedule would be supported (indexing valve does not allow you to water a specific zone, without watering every zone in between). Flex schedule waters the zones as needed, rather than by predetermined schedule and water needs of each zone go out of sync with each other pretty quickly (due to plant / shade / soil differences). If you choose to upgrade your valve, a three zone assembly (link) is widely available. You can likely find one in your local home improvement store. 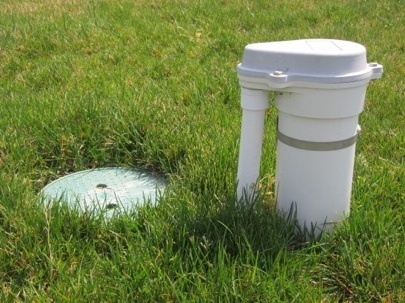 You will also need a matching Valve box, if you wish to hide your valves underground. Considering that they are by your pump, you could install them above ground and greatly reduce the effort / cost required. I’m guessing that you live near a lake (more likely), or have a dedicated well for irrigation (less likely). The pump will be needed to pump the water out of the lake or well and pressurize it for irrigation use. You could get rid of the pump, but you would need to connect your irrigation plumbing directly to your municipal water source, meaning you would need to start paying for water you use for your irrigation. Electricity needed to run the pump is usually cheaper (at least in Florida) than what you would be paying for water. I did not use a pump relay (link) because I do not live near a lake, nor do I have a well. The small box marks the place my old analog controller (similar to yours) used to be, the power for the controller was coming out straight from the wall, but location (being between the fence and a power conduit) was too narrow to fit outdoor Rachio housing. 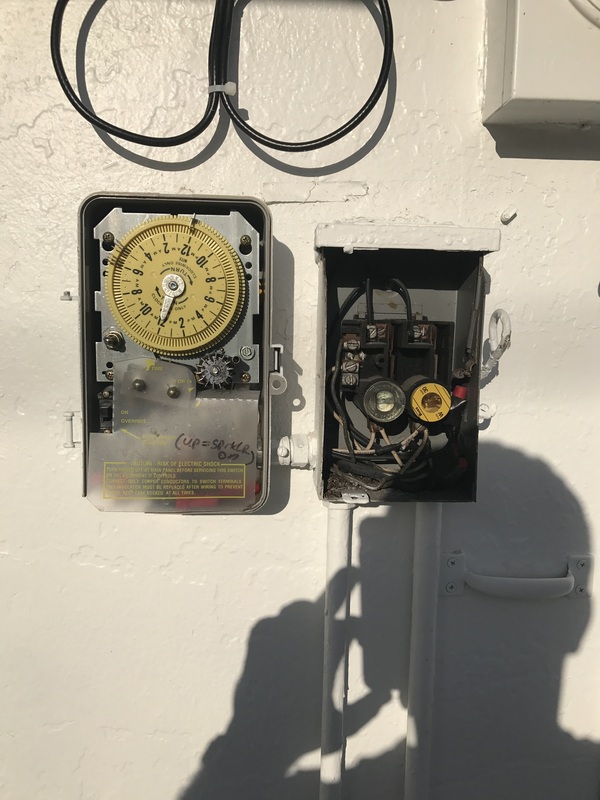 I’ve installed the box to weather proof the electrical connection and act as a junction box to split control from Rachio between the valves in the ground and the master valve left over from the old system. You do not have a master valve, but you would need to add the pump relay in it’s place (similarly connected to M and C terminals). Thanks for your answer, don’t have a lake near me so I think I have a dedicated well, so I guess the pump will stay there, I’ll paint it white to match the house and cover it. So basicly from the pump I’ll go to my 4 zones valve, then I’ll need to buy the relay and the rachio and wire it? Sounds about right, remember to take pictures and share your progress. If you are indeed dealing with a well, look for something similar on your property. Pipe diameter may not match exactly, but you should see a pipe coming from the ground, and connecting to another pipe which itself goes back underground. 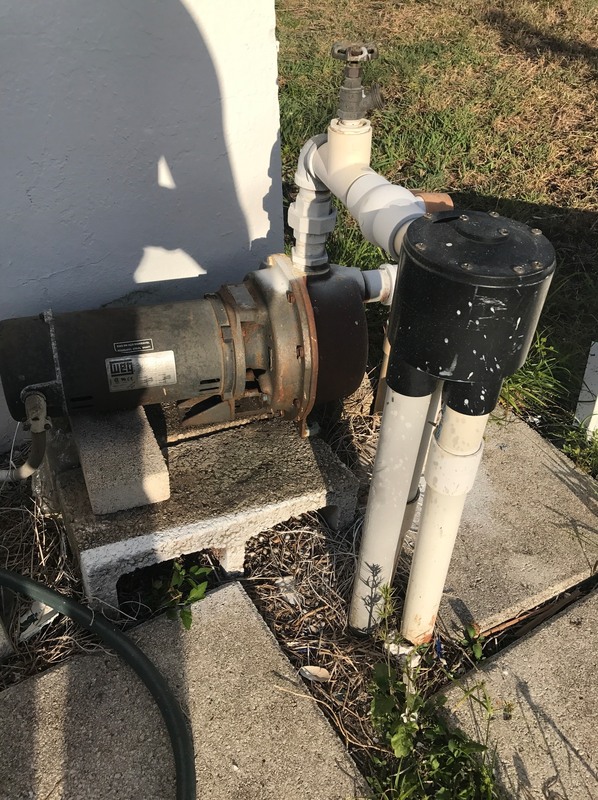 (smaller pipe is the one that is connected to your pump). If you do have a well and own a white house, you may also want to make sure that as little water from your sprinklers as possible hits the house. Florida water from the well contains plenty of iron and your white walls will start looking red before you know it, you may need some splash guards. I’m going to check today when I get home, don’t remember seeing any other pipe in my house other than the one I showed to you in the pics, and yes the water is horrible I saw a picture of this house in google maps from 2011 and the walls had red marks from the water lol. ??? I went to Lowe’s and a guy in the sprinkler system department told me that if I put solenoid valves my pump will break them. You think that statement is correct? As long as you don’t run the pump with all of the valves closed, this should not be an issue. Having Rachio turn the pump ON via a pump relay connected to a Master terminal will ensure that at least one zone is active while the pump is running. This will, in turn, make sure that the pump output is not blocked (blocking output by having all of the valves turned off, can cause excess pressure and damage to the valves). You could also look into adding a pressure regulator between the pump and the valves, but this will probably prove to be unnecessary. Make sure to turn on minimize water hammer (link) option within Rachio. This will help to avoid having the pump output temporary blocked while the zones are switching. Thanks you genie, once I finish relocating the sprinklers heads is that ok if write you again to get some help piping the valves? Do you mind? Thanks so much Gene, well tomorrow I’m going to do some sprinkler heads rearranging but I’m going to do some shopping today. I want to buy the pump relay and I sending you the pump picture to see if the relay I have in mind will work with the pump. Also I notice that the pipes feeding the index valve are 1 1/4 inches but the solenoid valves are one inch, I guess I’ll have to do the transition right? Yes, the relay should work for your needs. One thing I don’t like is that your setup is using 30 AMP fuses for a pump that does not consume more than 18.4 Amps, this is a possible fire hazard and I would recommend that you would consider upgrading your fuse box as well, if possible. A modern fuse box like this (link) with a modern breaker (link) may even save you money on your home insurance. As a matter of fact, I would recommend you check to make sure that the rest of your home doesn’t use a similar fuse boxes. Here is some info on why this may be dangerous (link). Thanks so much for your answer gene, I’ll buy the fuse box and the beaker also, the house inside it’s ok just the sprinkler system hasn’t been update yet, but I’m here to do it, now the other question, the pipes from the index valve are 1 1/4 inch I guess I’ll have to buy the adapter to feed the 1 inch size pipe of the solenoid valves right? Yes adapters are widely available, you should have no problem finding one at your local home improvement store. Are you planning on burying the valves or installing them above ground? If you are planning on using an underground valve box, than be careful about using the adapter too close to the valve box opening (it may not fit).